o Be Prepared, always bring your book and supplies to class. o Enter classroom quietly and sit down at your assigned seat. o Please look at the agenda that is written on the board. This agenda will tell you what we are doing in class that day. o Take out your homework and begin to work on board work. Board work will take up the first 5-10 minutes of almost every class. While homework is being checked or collected, students will complete the board work in their composition notebook. Writing time will be followed by an opportunity for discussion. This activity acts as a warm-up, introduction, or review activity. This board work is part of your classwork grade! SOCIAL STUDIES-Homework Sheets are distributed every Friday for the following week. Homework Sheets will include weekly Geography & Map activities, Journal entries (which will include a writing activity and may require reading from the text or other source) and a Current Event. ALL SUBJECTS- HW is always posted on this website. When you are out of the room for music, meetings, the nurse, or discipline, you are still responsible for all work you may have missed. You must ask me for the homework or work that you missed. It is your responsibility. If you know you will be missing a class, please let me know in advance. 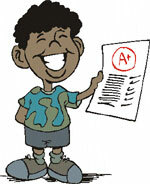 Projects-30% (Students will be given several projects a marking period. Sometimes projects will be given instead of tests. Projects may be individual, partner, or group projects.